THE CITIZEN ROSEBUD: Winners, All of Us. For starters, Anne has created some pretty incredible art work, featuring many of my favorite +40 bloggers. If you haven't seen Anne's work, take a peek HERE. I'll wait. And, for added measure, I've even been put to paint with an incredible rendition of me wearing an outfit inspired by Advanced Style. You can see me in it here, and Anne's version of it here. And secondly, Anne recently purchased a scarf from my shop, and rocked it. The image above taken from her Facebook page. Look how great she looks! She even did a fun blog post about it, which you can check out here. So, it's not without a great sense of joy, that I have the pleasure to announce that Anne Bray is a winner, too. Congrats to Anne Bray- she's the winner of the Advance Style book giveaway. She's the winner of my recent give-away: a signed copy of Advanced Style, and a $20 shopping credit towards a "Fresh Pick" from my shop. I hope you all can appreciate the "irony"- that Anne wins the book, whose images inspired the look that she painted of me. Life is kinda kooky, yeah? In the grandest sort of way. 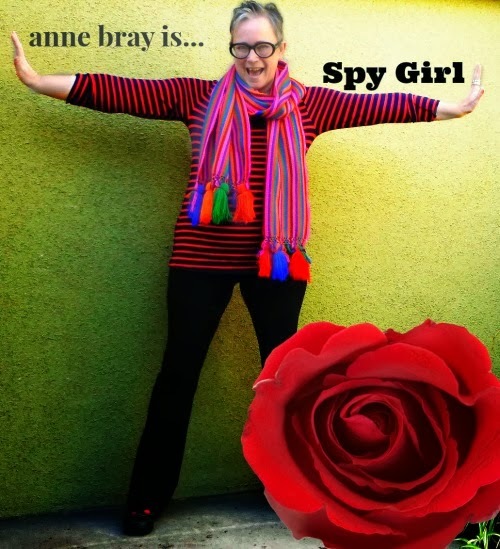 So congrats to Anne, aka Spy Girl for being a winner, an awesome +40 maven, and a muse. Which brings me to another announcement- and that is Shoe Shine. After a discussion regarding the best way to get more friends to participate, there are some changes in order regarding our monthly #shoeshine event. #SHOESHINE will still be a monthly community event, open to ANYBODY. You don't need a blog, you just need an image of YOU in your favorite kicks of the month, and the picture url to link up. That means you can link a picture from your Facebook (just make it public,) or from your cache Instagram pics (via Webstagram, Statigram, etc), or Flickr, or Tumblr, or anywhere there is a valid url link to your photo. All I ask is that you leave a comment on the post, and maybe visit a few of the other participants' pages. I will be sure to check out everybody's links, to thank-you for linking up! The first change is that we'll be making #SHOESHINE a week long event. That's right- you'll have plenty of time to get linked up, as the event will be open for 7 whole days. However, the folks who link up in the first 3 days of the event, will be in the running for various gifts and prizes, as a THANK-YOU for being on the ball, so to speak. Those SUPERSTARS will be mentioned the following week. The second change, and dare I say, improvement will be that #SHOESHINE is now scheduled for every second Tuesday of the month. That way, it shouldn't compete with some other blog events, such as Spy Girl's weekly Wednesday 52-Pick-Me-Up. 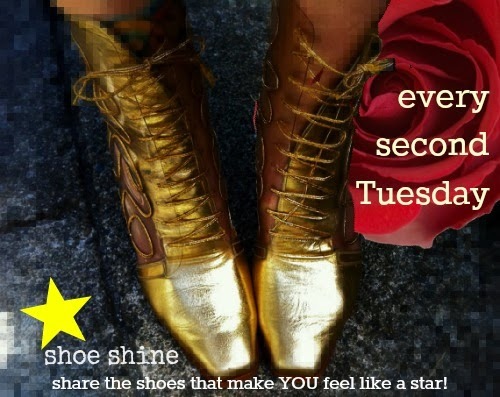 So, every second Tuesday of the month, (Tuesday = Shoes Day) the Citizen will host #SHOESHINE and it's stays open for one week. You then have one week to link up- and share your stellar kicks with your peeps. A lucky early bird (someone who links up in the first 3 days) wins a treat. They will be announced the following Tuesday. So, there you have it. We are winners, all. This month, our #SHOESHINE starts next Tuesday, January 14th. So get your kicks and take some pics! The link-up will be live from January 14th-21st. Hope to see you then! All of this over 40 blog community makes me all warm and fuzzy inside! Yay Anne! She is a winner, and a very talented artist. Her virtual catwalk of 40+ Bloggers is amazing and I'm so proud to be part of it. Aw, I AM THRILLED! That Advanced Style book has been in my Amazon "save for later" cart since before it was published! And a gift card too? Oh goodness gracious! Thank you thank you thank you! Ah, gotta run and do some work. Sheesh, they want me to work at work. The nerve! 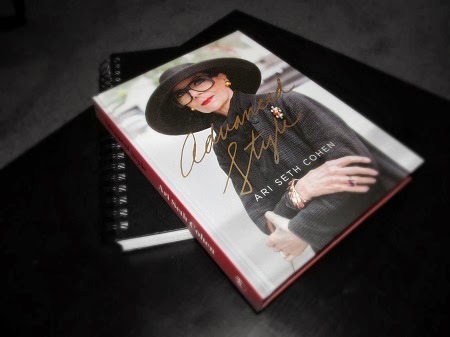 I adore Anne and so happy that she now has a copy of Advanced Style. 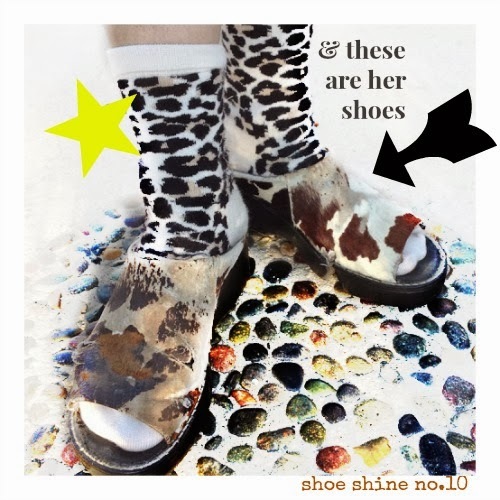 And love your Shoeshine changes! Anne always inspires me, love her attitude! Great scarf, and I'm looking forward to Shoeshine! Anne is freaking amazing--as you are Bella!!! I had a look at Ann's work, which is terrific. So nice to have such a talent. And I am glad with your Shoe Shine changes.